Last week I caught a show on the building of St. Paul’s Cathedral in London. The building is so iconic (and such an interesting feat of engineering) that few people remember what came before. 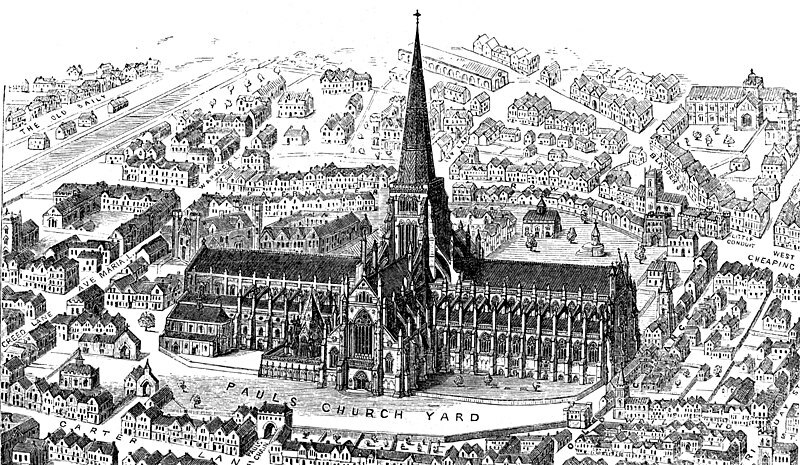 Old St. Paul’s was one of the largest Gothic cathedrals in Europe, with an enormous nave known as “Paul’s Walk”, beautiful stained glass and the tallest spire in Europe. It was not just a pretty building, but became the centre of London life–its nave was used for business, for learning the latest news, and later, during its decline, for all manner of buying and selling. London’s booksellers were located nearby on Pater Noster street. But, like many churches, the Reformation was not kind to it. 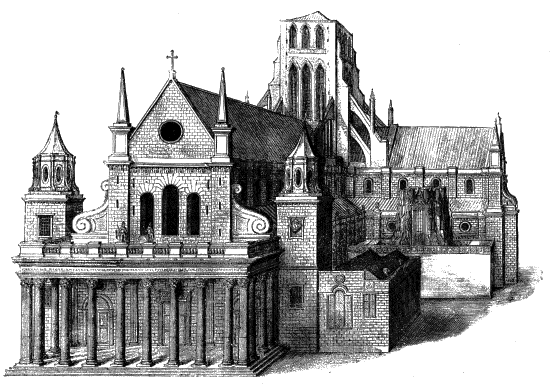 By the 16th century it had begun its long decline, and was actually sacked by a mob. Horses were even bought and sold there at one point. In 1561 the spire was destroyed by lightning. A belated attempt to stop the decline was made with the addition of a classical portico in the 1630s. However, at the moment of its death there had been hope–scaffolding had gone up to start a long-promised restoration. 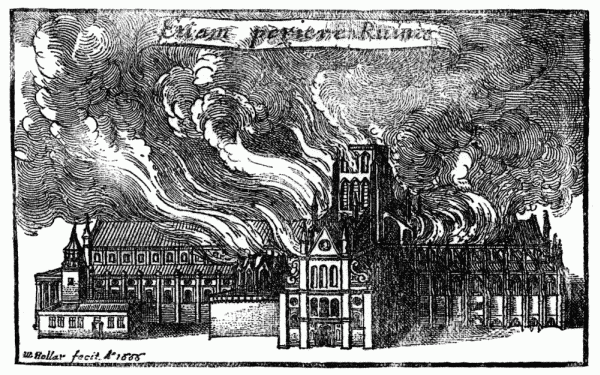 The scaffolding instead contributed to its demise in the Great Fire of 1666. The ruins did not come down until 1675, and were apparently tougher than they looked. When it came time to lay out the new church, a piece of gravestone was used to mark the centre of the new dome. Upon that gravestone, one word: Resurgam. (I shall rise again). And it did. 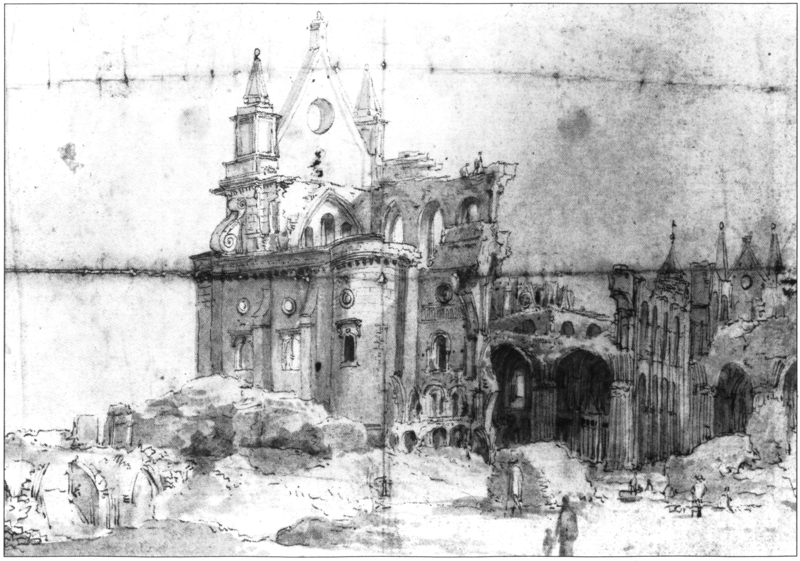 I retain my fondness, however, for the beautiful cathedral which fell into ruins and then perished in the fire. The sad depictions of its last few years, with its truncated spire, are particularly evocative. 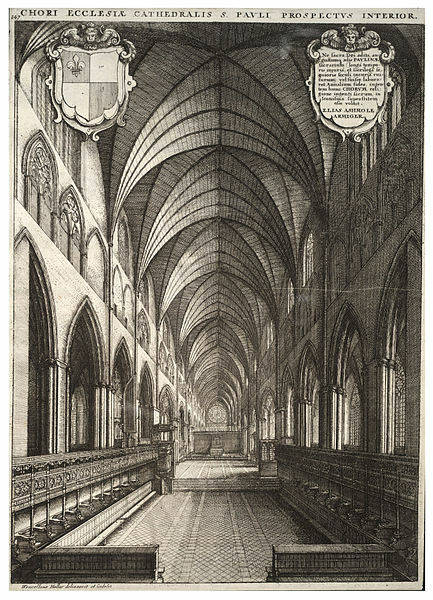 Today, nothing remains but a few scattered remnants of funerary momuments of the old, where bishops and counts and poets were buried–just enough to recall what came before.